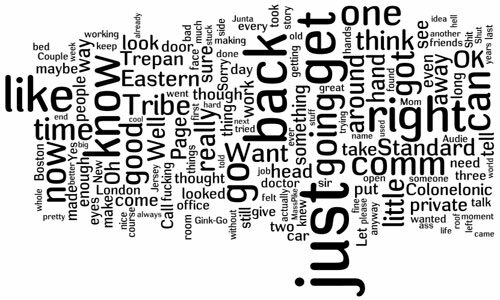 Rob turned me on to worlde.net, a clever little java application that lets you enter a chunk of plaintext (or an RSS feed) and turns it into a tag cloud image (the more a word is used the bigger it is). It’s got a tonne of formatting options to play with and is eerily hypnotic. The picture above is the full text of the novel “Eastern Standard Tribe” with the character names removed… I just happened to have it kicking around my hard drive. Good read to boot.